Agriculture sustainability: a question of crowd control! Home Special Reports Environment Reports Agriculture sustainability: a question of crowd control! We all know how much pressure agriculture is under. An increasing and more demanding population is pushing farmers towards an intensive and super-intensive farming to supply the markets with quality, cheap and safe food. High productivity is therefore needed for which most farmers make use of more and more fertilizers, pesticides, fungicides, or even water to fight drought – so the main question is how to produce more with less, in times of climate uncertainty. To address this question we have to acknowledge all the components of the productivity chain. No matter how much processing, packaging and marketing goes into modern food, the production of most of it depends, in fact, on the crowd of microorganisms responsible for soil functionality and plant phenotype, many of which have not even been granted a scientific name. The main ambition of BioClub (PTDC/AGR-PRO/1852/2014) is that next time one picks up a piece of bread or a bottle of beer, remembers who the ultimate producers of those products were – and it is not only the famous trademarks on the box. For many people soil is “dirt” and as such it is something to avoid or wash away. People change light bulbs, use public transports and debate the pros and cons of alternative forms of energy. But, how many thought about soil as one of the main ways we might reply to increasing concentrations of atmospheric carbon dioxide or water shortage? In fact soil is a regulator of the gas composition of our atmosphere; and one ha of soil has the potential to store and filter water for 1000 people. All we have to do is to guarantee that soil is alive! Agriculture over-exploitation can result in severe ecosystem degradation that leaves little to no soil legacy, defining soil legacy as the physical, chemical, and biological attributes and interactions that remain following long periods of farming. Biofertilizers are an important tool to recover soil legacy, and may function towards distinct objectives according to diverse degrees of soil degradation. When soil becomes dust and there is no relation between the physical (P), chemical (C) or biological (B) components of the soil (Fig. ), improvement of soil quality is only possible through the use of biofertilizers able to survive the soil surface stressful conditions, aggregate soil particles, improve water retention and improve soil living conditions. Crucial in this are mycorrhizal fungi. These organisms help plants grow through the supply of nutrients, improve soil structure and control of disease. In return, plants provide them with carbon. As well as aiding plant growth and defence, the fungi also allocate carbon in the soil, help plants to communicate and recruit microorganisms. 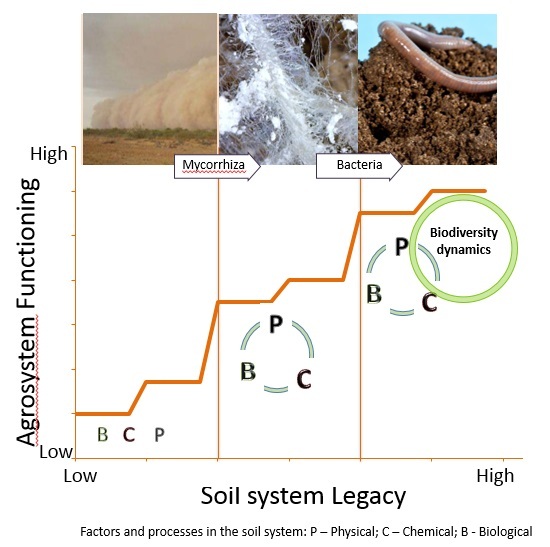 Fig: Schematic representation of the relation between soil system legacy ad agrosystem functioning, where biofertilizers may play key roles to improve soil functionality. Mycorrizal fungi contribute to increased soil system legacy by interconnecting the three soil basic components (P, C and B) leading to increased soil biodiversity and organic matter content. Once this stage is accomplished soil microbial community and plant microbiome may be fine tuned, through the use of bacteria based biofertilizers, to increase nutrient and water use efficiency. The bacterial components of the biofertilizers will re-introduce in the soil biotic community microorganisms performing key metabolic activities to strength the myriad of interactions among plant – microorganism-microorganism, and between the environment and microorganisms that shape the dynamics of the sustainable agro-ecosystems. At this high soil legacy stage biofertilizers will allow the reduction of the recommended dose of fertilizer use in at least 30% without decreasing productivity. BioClubaims at designing the best possible fertilizers and integrate them in the best farming managements (low soil mobilization) to increase soil system legacy to the level where the aboveground diversity is supported by the belowground diversity of the agro-ecosystem. In fact, we have to admit that our fields and our planet are ruled by microbes!